I am a big fan of all sorts of TV and movies, so over winter break I binge-watched so much on Netflix! I like a lot of the popular shows, like the Office, Friends, and American Horror Story, but I wanted to post some of my favorite series on Netflix that I don't hear very much about. I also included one movie that blew me away recently! If you went to a school in America, chances are you watched some Bill Nye the Science Guy. I have fond memories of the scientist and I think it's so cool that he got a Netflix series to target the young adults who grew up watching him. In each episode Bill Nye (who is a real scientist, by the way) discusses a different, often controversial topic such as climate change or alternative medicine. He hosts a panel of experts on the subject and often does live experiments to explain why scientists agree/disagree with common beliefs or opinions. It's informative and easy to watch! When I first tried to watch this series it confused me. I'd heard it was a prequel to Psycho, the famous horror film, but then the series was set in the present day and it didn't make sense. Once I got past that, however, the series is really well done and intriguing. It follows Norman Bates as a teenager when his possessive and down-on-her-luck mother buys a motel in a new town. I haven't finished the series, but so far it's amazing. This one has been getting a lot of hype recently and I'm so here for it, because it deserves it! 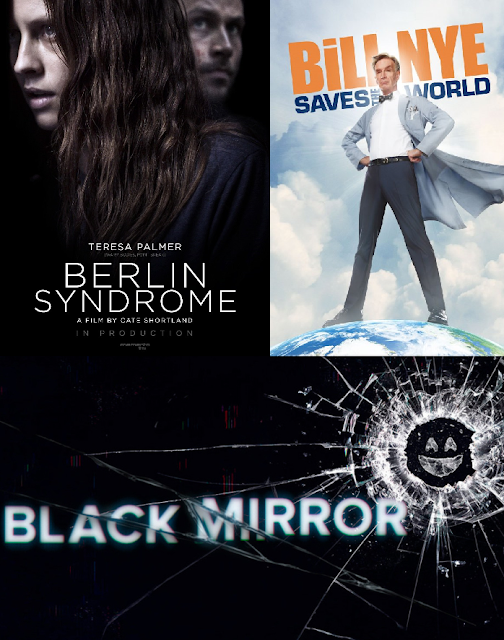 Black Mirror is an anthology series (similar to the Twilight Zone) in which each episode has different characters and a different plot/theme. Most of them center around technology and the potential it has to change the world--often for the worst. I recommend skipping the first episode (trust me, it's quite shocking for most people!) and watching one of the lighter episodes first, like Nosedive, San Junipero, or Hang the DJ. The fourth season was recently uploaded and I loved it! Black Museum was my favorite episode from the new season. Gotham is a prequel to Batman, but here me out: I've never seen a single Batman movie but I like this show a lot! It follows the detective James Gordon, who is played by the actor who portrayed Ryan in The O.C., and his work in Gotham City before Batman becomes Batman. I think it's interesting because it shows the origins of a lot of the famous characters from Batman, like the Penguin and Catwoman. This is another one that I haven't finished but I love what I've seen of it! If you're a fan of supernatural shows, like the Vampire Diaries or Teen Wolf, you may want to check out this Netflix original. It has a great cast, including Bill Skarsgard from It (2017), and begins after a girl is murdered in a small town. It's an adult take on the supernatural genre and it's very cool. Finally, this last recommendation is a movie that I watched over winter break. Berlin Syndrome is based off of a book of the same name, which I haven't picked up yet, in which a tourist in Berlin has a one-night stand which results in her getting trapped in a man's apartment. The name comes from 'Stockholm Syndrome', in which a captive starts to trust and become attached to their captor, so you can guess where the plot goes. I love Teresa Palmer and I thought this movie was so good, I've been telling everyone about it. I'm always looking for more recommendations, so leave them below if you have any! Do you like any of these shows? 9 comments on "6 Netflix Recommendations!" I started to watch Bates Motel and was so confused after the first episode, like you say you were! I gave up with it after that, it all seemed so strange and I didn't think it would be something that I would have enjoyed! Currently watching Ozark which is good so far. Narcos and Mindhunter were amazing! I actually had no idea that is what Bates Motel was about! I really want to watch it now! Berlin Syndrome sounds interesting! The last series of Black Mirror was a bit hit and miss for me, which is a shame, though when it was good it was really good! I love black mirror! I binge watched it straight away when the new season came out :) soo good! I haven't watched any of these. We've been watching Shameless. I really don't like the characters but I keep watching anyway...lol Thanks for the recommendations! I haven't watched any of these but my fiance watches Gotham and every time I try and watch it with him, I fall asleep. Great recommendations!